In February of 1839, Portuguese slave hunters abducted a large group of Africans from Sierra Leone and shipped them to Havana, Cuba, a center for the slave trade. This abduction violated all of the treaties then in existence. Fifty-three Africans were purchased by two Spanish planters and put aboard the Cuban schooner Amistad for shipment to a Caribbean plantation. On July 1, 1839, the Africans seized the ship, killed the captain and the cook, and ordered the planters to sail to Africa. On August 24, 1839, the Amistad was seized off Long Island, NY, by the U.S. brig Washington. The planters were freed and the Africans were imprisoned in New Haven, CT, on charges of murder. Although the murder charges were dismissed, the Africans continued to be held in confinement as the focus of the case turned to salvage claims and property rights. 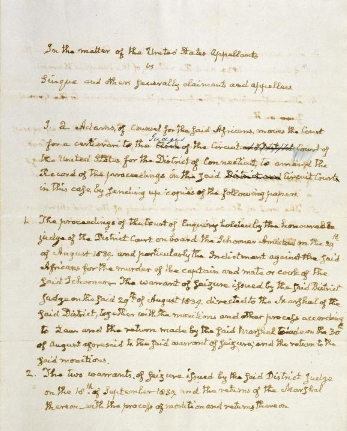 The case went to the Supreme Court in January 1841, and former President John Quincy Adams argued the defendants' case. Adams defended the right of the accused, a group of free Africans led by Joseph Cinque to fight to regain their freedom. The Supreme Court decided in favor of the Africans, and 35 of them were returned to their homeland. Want to help make these records more discoverable? The case file containing records filed in the Amistad case is the subject of our newest transcription mission on the Citizen Archivist dashboard. Every word you transcribe improves search functionality in our Catalog and helps to unlock history. Learn more about this case in our latest Catalog email newsletter!